A man drops off a semi-conscious woman at a hospital and speeds away. The only clue to her condition is a handbag full of pills. But this is not an anonymous woman, but a woman "built for public". She (Meryl Streep) is the actress daughter of a famous actress (Shirley MacLaine) and her life of wealth and position has not brought her peace and happiness. 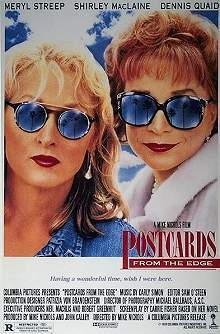 Written by Carrie Fisher (daughter of Eddie Fisher and Debbie Reynolds), and based on her semi-autobiographical novel Postcards from the Edge, this film is a sharply-written look at the Hollywood machine and the people it grinds upon. Suzanne Vale grew up in the shadow of her singer-actress mother, with birthday photoshoots and revolving-door fathers. She has not coped well and her drug abuse is fueled by an empty life and a procession of embarassments. The only way that Suzanne can continue to work is if she lives with her mother and takes regular drug tests. As she makes her way through the far from glamorous life of a working actress she nonetheless faces universal problems. Suzanne's family are pushy, interfering, and embarassingly forthright. Her boyfriend (Denis Quaid) is a questionable choice, her work is frustrating and her co-workers criticise her behind her back. Although Suzanne is one of the elite, born and bred, she is very human and Meryl Streep does a wonderful job as the struggling Suzanne. The ultimate stage mother is played, without eyebrows and makeup in one scene, by a brave Shirley MacLaine. Mike Nichols does an excellent job with his cast, taking full advantage of Fisher's masterful script. Watching this film is time well spent.